Hanukkah, also spelled Chanukkah, is a Jewish holiday which takes place in the winter. Families exchange small gifts during Hanukkah, and many relatives and friends send each other flowers as means of celebrating together and marking the holiday. Blue and white arrangements are popular for Hanukkah flowers because blue , white and silver are considered the traditional hues of the holiday, though yellow and gold arrangements are popular as well. Hanukkah, also known as the Festival of Lights, is a Jewish holiday which takes place over eight nights starting on the 25th day of Kislev in the Hebrew calendar. This means that it usually falls in late November or December. This holiday commemorates the rededication of the Temple of Jerusalem in 165 BC, after Jewish soldiers, known as the Maccabees, triumphed over Syrian-Greek soldiers who had seized the temple and dedicated it to Zeus. In attempt to purify the temple the Maccabees wanted to burn oil for eight days, but only had a day's supply of oil. They lit the menorah (candelabrum) with this oil anyway, and to the light lasted all eight days. This miracle is now celebrated every year when candles are lit on a Hanukkiyah, or candelabrum with eight branches and a ninth branch set higher than the others. On the first day of Hanukkah one candle is lit, on the second two candles are lit, and so on. The origin of blue, white and silver as the traditional colours of Hanukkah is unknown, but it is thought that it has to do with ancient dictates for prayer shawls to have specific blue threads, to represent the colour of heaven, and specific white threads, to represent purity and cleanliness. Menorahs would have been made of intricate metalwork and/or silver. This colour scheme lends itself well to a number of winter flowers. 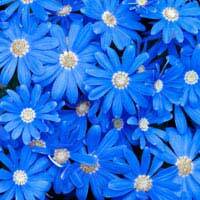 Dyed blue roses are often in demand during Hanukkah, but blue hydrangea, anemones, frangipani, forget-me-nots and delphinium are also options. White roses are popular at Hanukkah, as are tulips, orchids, amaryllis, anemones, lilies, carnations and freesia. Creating an all white bouquet and displaying it in a blue vase is another option, as is simply displaying white poinsettia plants rather than floral bouquets. Silver vases, baskets, ribbons and bows are also options in Hanukkah arrangements. Yellow and gold are not traditional Hanukkah colours, but they are popular in floral arrangements because of their warming shades and some say because yellow and gold are reminiscent of the colour of the flames in the miraculous eight days of light from the temple oil. Gold flowers are generally sprayed a rich colour, and popular options are rucus, berries, holly leaves and branches of eucalyptus. The yellow flowers of Chinese Juniper are all-natural, as are roses, tulips, sunflowers and gerbera daisies. Yellow flowers also signify friendship and joy, making them particularly appropriate for Hanukkah. Adding yellow or gold accessories such as ribbons, bows and baubles can help make an arrangement feel extra-special as well. Understanding the history of Hanukkah (Chanukkah) as the Festival of Lights will help anyone select the most appropriate Hanukkah flower arrangements. Blue, white and silver arrangements are always good choices as these are the traditional colours of Hanukkah, while yellow and gold arrangements remain popular as well.